POPcon™ Exchange POP3 Connector connects your Exchange server to your internet mailboxes. POPcon periodically downloads your emails from POP3 and IMAP mailboxes and distributes them to exchange mailboxes. It supports multiple domains and multiple POP3 as well as POP3-SSL, IMAP and IMAP-SSL mailboxes of both single-user and catch-all (multi-drop) type. Best of all: POPcon Exchange POP3 Connector is licensed on a low per-server basis with no additional fees for users or mailboxes. POPcon is compatible with all Exchange versions: Exchange 2016, Exchange 2013, Exchange 2010, Exchange 2007, Exchange 2003, Exchange 2000, Exchange 5.5, Exchange 4.5 as well as all the SBS versions (2011 SBS, 2008 SBS, etc.) plus almost any SMTP mail server like Lotus Notes or Tobit David. The software runs as a background service under any Windows Server version (Windows 2016, 2012, 2008, 2003, 2000) or even normal Windows workstations (Windows 8, 7 or XP). Test the full product for 30 days without any restrictions. If you are sure POPcon meets your needs you can order the software online. This version automatically converts to the full, non time limited product once you enter a license key. Instead of receiving emails directly via SMTP (you'd need a fixed IP always-on Internet connection for that), POPcon will download your POP3 and IMAP email periodically and then forward it to your Exchange Server. See our free Exchange configuration guides for a step-by-step guide to configure your Exchange Server for sending and receiving (via POPcon) internet mail. Download the free 30-day trial version of POPcon Exchange POP3 Connector and test the full product until you are sure it meets all your requirements. You can license POPcon Exchange POP3 Connector online and will receive the license codes by email in just minutes. Let us know if you are looking for a feature not yet implemented in POPcon. We are always looking for new ways to improve the product. 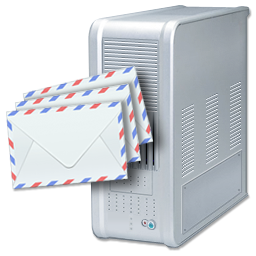 Poll private POP3 and IMAP mailboxes and forward mail to a single MS Exchange or Lotus Domino Server mailbox or distribute mail collected in a single catch-all POP3 or IMAP mailbox to multiple Exchange server mailboxes according to user the mail was sent to. POPcon analyses the mail header fields (TO:, CC, received .. for, X-RESENT-TO, etc.) and filters mail recipients for matches to pre-configured "allowed" domains. 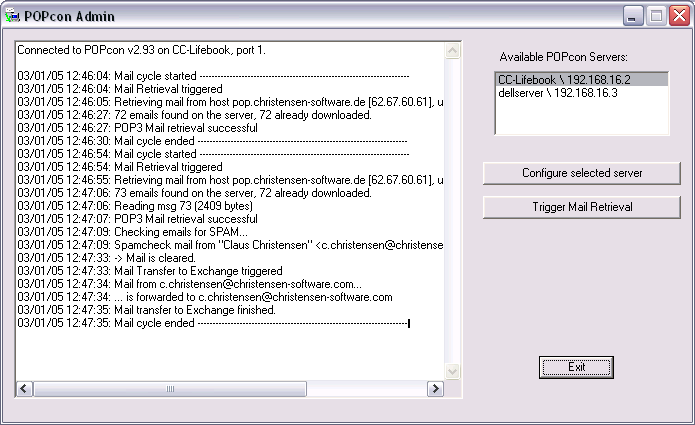 Can be installed on same machine as MS Exchange Server - uses only one internet connection and at least one POP3 mailbox to receive mail for the whole workgroup or company. Minimum download schedule interval: 1 minute. NEW: Now also 0 minutes (contiuous downloads) implemented! There is no problem if downloads take longer than the scheduled interval. In these cases POPcon will continue with the next mail cycle at the next full minute after ending the current one. Flexible scheduling for mail retrieval based on day of week. Have different retrieval times at night and on weekends or have POPcon check for mail every minute. Automatically uses a configurable dial-up networking account to connect to and disconnect from the internet. Supports Routers and dedicated internet connections as well. Monitor POPcon's actions from any system in your network using the "POPcon Administrator" utility included with the software. Trigger mail retrieval at odd times or configure additional POP3 mailboxes to poll - all from your workstation. POPcon is installed as a service. POPcon is started at system start-up time without the need for a user to log in. POPcon is also available in a PRO version with additional functions.